Flash to face Captain Cold, Heatwave and Golden Glider in "Rogue Time"
The next episode of Flash will add a new villain to Captain Cold's group the Rogues. His sister Lisa Snart who becomes the Super Villain Golden Glider. This means that Flash will really have his hands full. 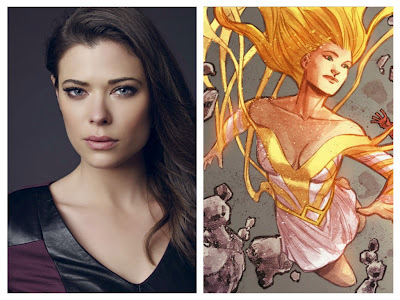 Lisa Snart will be played by Tomorrow People Alum, Peyton List. CAPTAIN COLD AND HEAT WAVE RETURN TO CENTRAL CITY; PEYTON LIST GUEST STARS AS LISA SNART — The Flash (Grant Gustin) learns that Captain Cold (guest star Wentworth Miller) and Heat Wave (guest star Dominic Purcell) have returned to Central City. This time Snart has brought along his baby sister Lisa (guest star Peyton List) to help wreak havoc on the city. John Behring directed the episode with story by Grainne Godfree and teleplay by Brooke Eikmeier & Kai Yu Wu (#116).